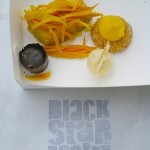 I know I blogged about Black Star Pastry last year but I was recently re-reminded of how great it is. The macro-sized patisserie has sort of provided the menu to my week – or a kind of diary spelt in sugar, ganache, elderflower and rosewater. It started last Saturday with a Zucchini and Pumpkin Muffin ($3.50) I bought, just before the gavel came down on a house that Will really wanted to buy at auction. I needed some oven-baked-fortification to steel myself for the scary bout of bidding I was about to witness. I really liked the muffin (whoever knew that timid zucchini actually had flavour?) but could only eat half of it before the auction started. It was that nerve-wracking. I’ll spare you a dramatic re-telling of the actual auction (but if you want, you can imagine a cheesy movie montage with overloud timpani and bad close-ups of people’s sweaty foreheads, etc), only to say we were hugely relieved when the auctioneer yelled ‘Sold’. Will got the house, despite last-minute deviousness by another bidder we have since dubbed ‘Snake-In-The-Grass’. 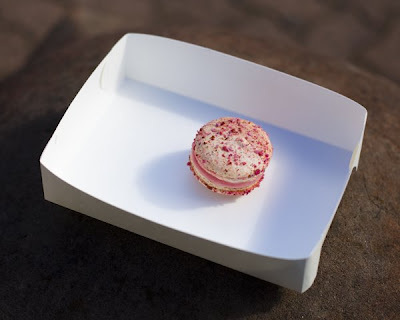 So we had a celebratory Rose and Lilac Macaron ($3.50) a few hours later. And it was occasion-worthy: crumbly when you split it, but crisp when you bit in and the filling was a liquid hit of rosewater delicious. My bulk-Black-Star-Pastry-buying that day also included a Mandarin and Lemon Myrtle Panna Cotta ($5). I liked how the mandarin pieces were playing it both ways: gloopy-sweet and a little tart, with a few shreds of lemon myrtle for modulated punch – like the feisty topic that ignites an otherwise civil dinner party conversation. I ate a third of it, left it in Will’s fridge and a day or so later, reminded him not to forget it. “Too late, I yum’d that up yesterday,” he said. 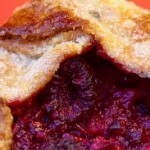 Later in the week, I went on another buying blitz at Black Star Pastry. This time, the treats were for a dinner being thrown by Blake and Lex (who make the most moreish mushroom soup and za’atar bread I’ve ever eaten). 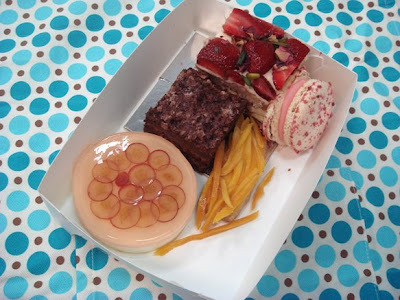 You can see (above), the Strawberry Watermelon Rose Cream Cake ($6), Elderflower Cheesecake ($6), Chocolate Hazelnut Torte ($6), Saffron Mango Shortbread ($3) and another rose-speckled macaron. All are as delicious as they look and the cheesecake is definitely a conversation-starter: particularly regarding the mysterious concentric circles trapped in the icing (our Sherlock Holmes-like guess: grapes, sliced painfully thin). What you can’t see above is the slick chocolate topping of the torte (a casualty of cake-box transportation, the icing was wiped clean against the lid and diligently spot-removed, one spoonful at a time, by Will). You also can’t see the Mushroom, Pine Nut, Spinach Pithivier ($5), a flaky, crusty pie-slice that completely monopolised my thoughts for a few days after I had it for lunch. The sweet, near-caramelised mushrooms still haven’t entirely left my brain and I have an auto-craving right now, just thinking about it. I asked one staff member what it was they did to the mushrooms that made them so tasty. All she said was that they used, “lots of fresh herbs, lots of love”. So I am plotting my next visit again (hopefully it coincides with pithivier presence on the counter). 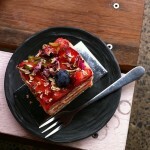 Better still, Will’s new house is within walking distance of Black Star Pastry. 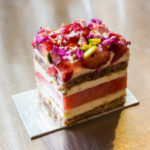 So I’ll have to improve my cake-box tranportation methods, because it’ll be hard to fight the gravitational path that curves towards this wonderful patisserie. 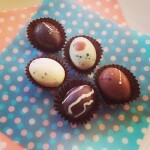 ooooooh, my tastebuds are in tormented tantalization..currently plotting a time to visit. Love your blog. -Spike. We were there yesterday – I had a great tarte tatin and my partner had a fantastic cannelle – have you tried those, they are great. I think lots of love might mean lots of butter!! Thanks for the lovely comments! I have heard so much about the cannelle and really must add that to my shopping list next time I’m there. Thanks for your lovely comment Lee Tran – I was just on my way over *here* to thank you for this recommendation! 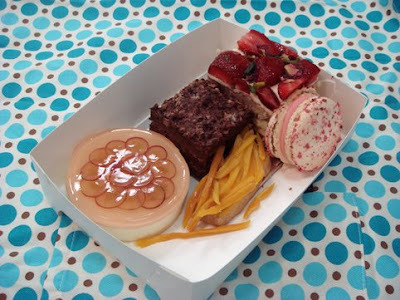 Glad you had sweet-tooth-rewarding visits Simon & Kate! And thanks especially for your kudos, Kate. Ah, the pressure … ! Hope the next recommendation lives up to your excellent, gold-star standards. Squeak has just headed there now… eclairs are a must! I am of the firm belief that the watermelon rose etc. slice ACTUALLY tastes like what the colour pink would taste like 🙂 This place is heaven!